Yesterday was a toss-up for reasons not to send the kids to school: on the one hand, it was a snow day, and on the other, they were both sick anyway. So I kept dinner simple and made a stew out of all of the leftover bits and pieces I had in the fridge. Honestly, a traditional stew (at least the way I learned it) is a bit of whatever you’ve got around anyway, so it seems fitting. 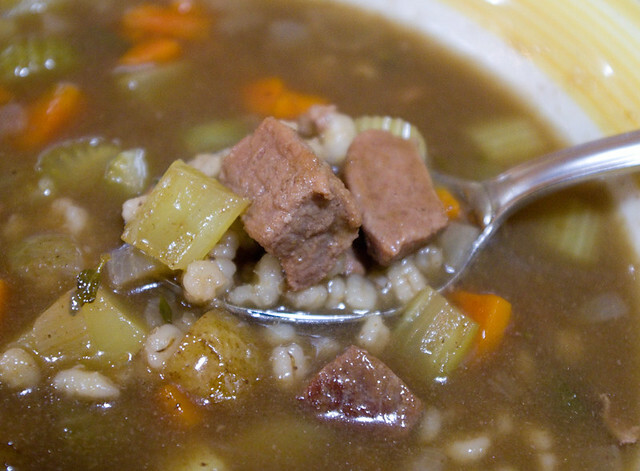 The stew contained beef, onions, garlic, carrots, baby potatoes, celery, homemade beef broth, store-bought beef broth, pearl barley, red wine, fresh thyme, fresh sage, a bay leaf, and salt. I whipped it up in the Instant Pot in about 45mins, including preheating/venting time. It wasn’t the best stew I have ever made, but it was tasty, hearty, warm, and went down easily for those with sore throats. I’ll consider it a win. Last night I wanted to do something a little different for Sunday dinner, but I still wanted it to be warm and hearty. The temperatures on the weekend had dipped below -30°C (-22°F), which calls for solid comfort food in my opinion. On Saturday afternoon I delved into my new Christmas-gift-card acquisition, The Complete Indian Instant Pot Cookbook: 130 Traditional & Modern Recipes (Chandra Ram, 2018) and picked rogan ghosh, aka lamb stew (page 2019) and rotis from the plethora of recipes that I wanted to try. It was the first time I ever attempted to cook an Indian dish from scratch, although I’ve used pre-packaged sauces and curry pastes many times. It’s a good thing that I started prepping on Saturday, because I had a really hard time finding some of the ingredients! I discovered quickly that most chain supermarkets around here don’t carry lamb shoulder, and as it turns out some of the more specialty stores like the Mid-East Food Centre, where I’ve had great luck in the past, had been shorted on their order that week. I hit at least six stores before I ended up at George’s Meat Shop, which luckily had the lamb in stock. Neither they nor any of the other places I visited carried serrano chilies, nor did the next three, at which point I admit that I just gave up and asked Google for a good substitution. Apparently jalapeno peppers are similar in taste but not nearly as hot, so I went with those and simply doubled the amount of peppers. Luckily that worked out okay. But if anyone has any suggestions as to where in the Ottawa area carries serrano chilies, please let me know! I chopped up my meat and slathered it with marinade on Saturday night, leaving the prepping of the spices and the vegetables until Sunday. What with the speed of the Instant Pot, all of that chopping took significantly longer than the actual cook time of the dish. The finished product was definitely worth it, though. 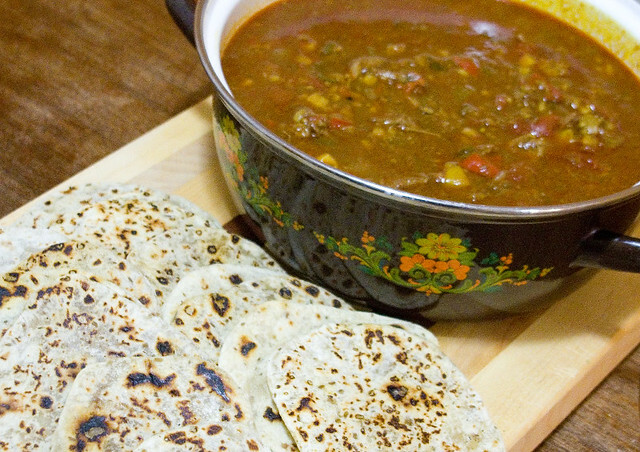 My whole family loved it, and it wasn’t too spicy for anyone (always something I have to take into account with our rather over-sensitive tongues). I was pretty sure it wouldn’t be too spicy, though, given that we all eat lots of jalapenos my homemade salsa. I think that the only mediocre part of this meal (although not at all horrible) was my rotis, which in retrospect I didn’t roll nearly thin enough. I loved their flavour, but I need a lot more practice to make rotis I’m actually proud of. 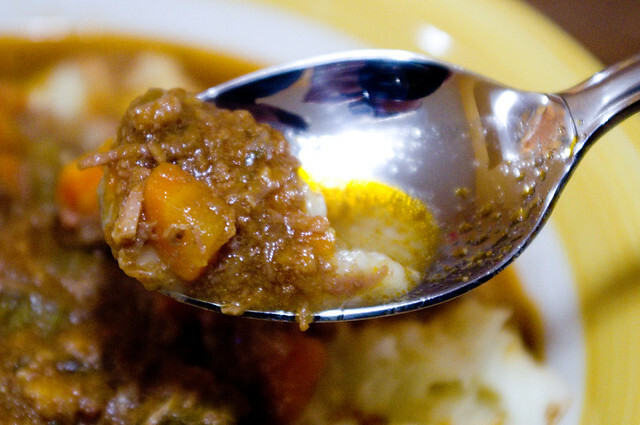 After some Googling, I’ve learned that apparently you can make the stew using mutton, goat, or even beef. I really liked the rich flavour of the lamb, so I can’t see using beef instead unless it’s out of budgetary consideration, but I like the gaminess of mutton and goat, so I might eventually give them a go. I assume that these would have a longer cook time because the meat is tougher, though. Yesterday I decided I wanted to try to make something a bit more complicated with my new Instant Pot (or, as my husband puts it, I wanted to play with my new toys). Since I had some red wine left over from Christmas that needed to be used up, and nobody in our household drinks wine, I Googled and found a nice recipe for Instant Pot Beef Bourguignon from Instant Pot Eats. I dug a couple of large chunks of beef out of the freezer the night before to thaw, and I had most of the other ingredients already at home. I did have to send the hubby out for tinned tomatoes and fresh carrots, and somehow we had run out of tomatoes. I’d never made this dish before, but for all that I’ve heard that beef bourguignon is a complicated dish, I discovered that it’s really just a fancy kind of stew — and I’ve made many stews over the years. Making it in the Instant Pot really sped things up, but I could have done something very similar in the slow cooker, so long as I planned ahead. I really appreciated that I could saute the ingredients and pressure cook them all in the same device, though, since that saved me quite a bit of effort and clean-up time. Actually, I overestimated how long it would all take me, so I took advantage of the “keep warm” function as well. I don’t exactly have a base for comparison, but I would deem it a definite success! The recipe’s serving suggestions are either with mashed potatoes, fresh bread, pasta, parsley dumplings, steamed vegetables, cauliflower rice, or cabbage with butter and pepper. I took advantage of my bread machine and served it with slices of freshly-baked white bread (page 66, Bread Machine: How to Prepare and Bake the Perfect Loaf by Jennie Shapter, 2002). 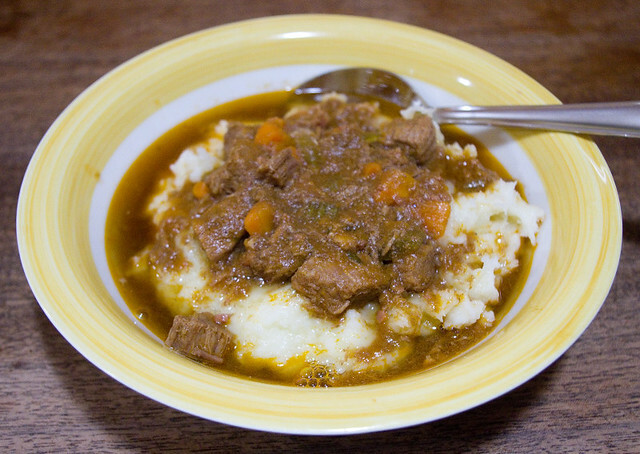 While this combination was lovely, I think I’d like to try it over mashed potatoes next time, in the same style Beef and Guinness Stew. And yes, there will be a next time, judging by the family appreciation of this dish! The meat was tender, the sauce flavourful, and it was nice and filling on a cold winter’s day. My husband ate so much that he was groaning afterwards about how full his stomach was, and yet he regretted nothing. My house is all topsy-turvy at the moment because I’m doing work on the kitchen. (On the kitchen, as well as in, since I seem to work in the kitchen pretty much every day.) I managed to obtain some additional, second-hand cupboards, which means I’ll soon have new cupboard and counter space eventually. In the short term, this means that half of the contents of my kitchen are currently in the dining room, so we have to eat in the family room, and the day-to-day mess of the family room is pushed into other rooms… I can’t wait to have this mini-reno completed, not just so I can use the expanded kitchen space, but so order is once again returned to my house! I’ve been trying not to cook anything super-involved, since prep space is currently at a bare minimum, and to me that means making Dad’s Biscuits. My mom picked me up what I think is a Perfect Pie Blender, although it’s branded with the President’s Choice logo, so it may be a knock-off. Or maybe PC has a deal with Kitchen Innovations, I don’t know. I can guarantee you that my mother didn’t pay $40 for it, though. Knowing Mom, she probably found it on clearance for $5 or less. 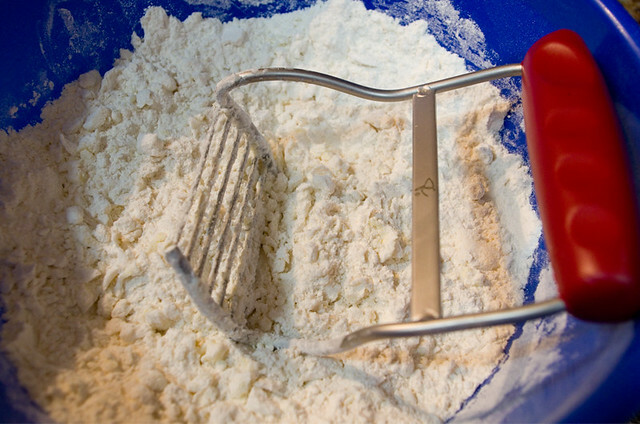 At any rate, the Perfect Pie Blender is far cry in shape and style from the traditional style of pastry blender that I grew up using. The company claims that it will make perfect pastry in sixty seconds, which is an exaggeration if you ask me, but it is definitely faster than my old method. One reason for this is that the blades are sturdier and the updated shape means that I’m not constantly cleaning food out from between the wires. It’s generally a more ergonomic design, too. Given that I’d been making pie using the old style blender since I was a kid, I thought I’d have a harder time getting used to a new tool, but I’m surprisingly quite happy with the new blender. I’d recommend it — although I definitely wouldn’t recommend spending $40.00 CAD on it like Amazon.ca suggests, especially when you can get it for $12.60 USD on Amazon.com. 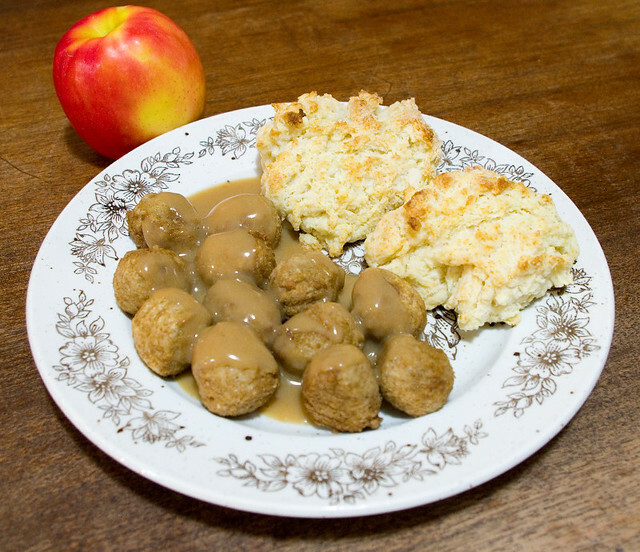 The other day I nuked up some IKEA KÖTTBULLAR meatballs while my husband stirred up the ALLEMANSRÄTTEN cream sauce. We’re very sophisticated people, don’t you know. The original plan was to throw on some oven-baked french fries, but I miscalculated the amount we had left in the freezer, so only the kids got fries. My husband and I ate our meatballs with biscuits instead. I added an apple to our meals because there has to be some kind of fruit or veg with every meal, doesn’t there? Yesterday the kitchen mini-reno had continued apace and we couldn’t even see the dining room table any more, let alone eat at it, so we dined on TV trays in the family room. 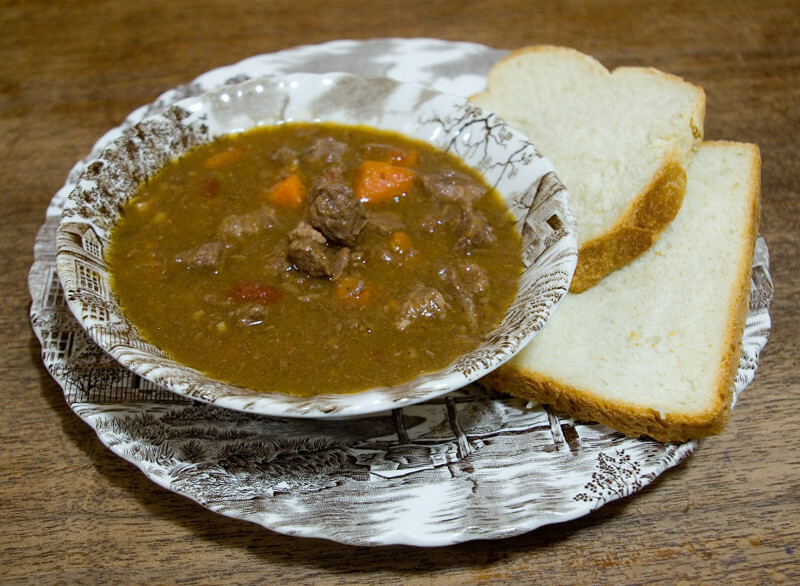 I made Guinness beef stew based very, very loosely on this recipe, but it was more improvised than not to help me use up what was in the fridge. I still have a surplus of parsnips and celery, which remain fresh and crisp in my fridge, as well as potatoes from my garden, so they had to go in there. 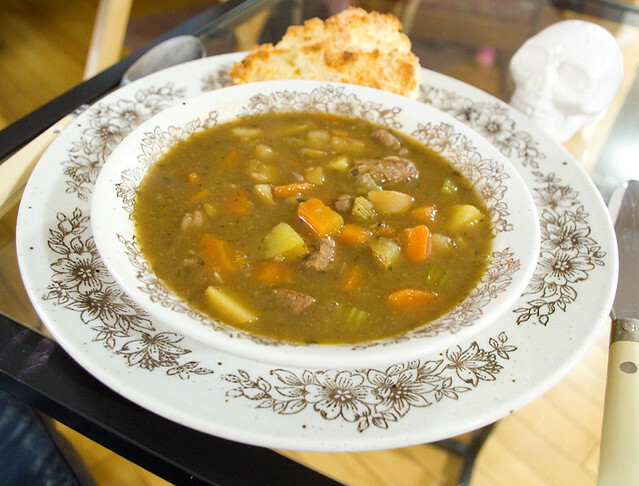 To my kids’ delight, I served the stew with biscuits for a nice, hearty dinner. I didn’t even have to argue with the girls to eat their vegetables even though the stew was more veggies than anything else. That’s always a nice change.